Excellent for sanding parts spinning in a lathe, drill or simply pulling around a piece of material to add a radius. 3 grits, 120, 180 and 320. A fundamental sanding tool in any maker work space. 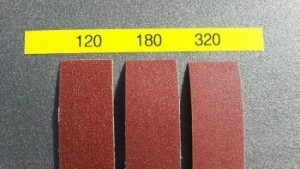 220 Grit. Size: 9x11" Waterproof, Flexible "A" weight paper backing. 1 Sheet. 320 Grit. Size: 9x11" Waterproof, Flexible "A" weight paper backing. 1 Sheet. 400 Grit. Size: 9x11" Waterproof, Flexible "A" weight paper backing. 1 Sheet. 600 Grit. Size: 9x11" Waterproof, Flexible "A" weight paper backing. 1 Sheet.